Главная » ipad » Taxi Crab: rate Shanghai taxi drivers! Taxi Crab: rate Shanghai taxi drivers! 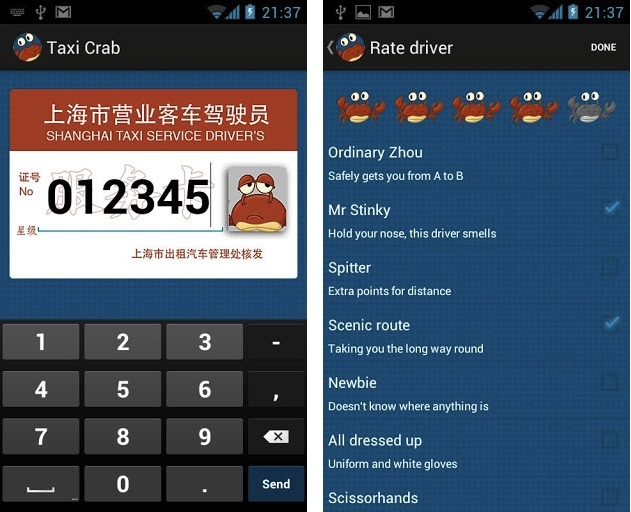 Taxi Crab lets you rate and tag taxi drivers in Shanghai, China. Taxi Crab is a free service provided by ExploreMetro, makers of Shanghai’s best metro map. STEP 1 — Enter your taxi driver’s 6 digit code, which should be visible at the front of the taxi. STEP 2 — give your taxi driver a rating out of five stars, and add tags! STEP 3 — see the results from other users, including average rating and popular tags. We’ll even tell you if you have driven with the same taxi driver before! Для андроида тоже есть своя версия. Опубликовано 26.11.2012 в рубрике: ipad.